Black Gold to Bluegrass is the first such work that concentrates wholly on the Second Spindletop Oil Boom and what happened afterward-taking the story from the oil fields of Southeast Texas and Louisiana to the Bluegrass of Kentucky. After partnering with Thomas Peter Lee of Houston, Frank Yount, water-well driller turned wildcatter, struck it rich, and the Yount-Lee Oil Company began a remarkable march that almost took it to the top of the oil industry. Although he used some of his wealth to benefit his fellowman, Frank Yount, also put together a priceless collection of antique violins, and some of the classiest and most expensive automobiles of the day, including three Duesenbergs and a Cord. He built a state-of-the-art Saddlebred training facility in Beaumont, hired dashing horseman Cape Grant to run it, and directed him to take the horses of Spindletop Stables to competitive shows throughout the county-and win! Frank Yount died young at age 53 in November 1933. Within two years, Pansy-his wife and principal heir-and the investors in the Yount-Lee Oil Company sold the enterprise to Houston attorney Wright Morrow for then what amounted to the third-largest financial transaction in American business history. Morrow, who later became one of the giants of Texas politics, immediately parceled off most of Yount-Lee's oil assets to Stanolind (Standard Oil of Indiana), a subsidiary of the giant Standard Oil conglomerate which later became Amoco. In spite of the magnitude of this transaction, when expressed in Depression era dollars, it was later widely acknowledged that no one, save perhaps Frank Yount himself, fully understood the astronomical significance and value of the Yount-Lee holdings. Pansy, no less independent and colorful than her husband (but somewhat more flamboyant) took her part of the family's fortune and moved Spindletop Stables to a 1,066 acre show farm in the horse country of Kentucky, building a 45,000 square foot mansion which she named Spindletop Hall, the centerpiece of the new and extremely successful Spindletop Farm. The farm became the most innovative saddle horse breeding facility of its time, and Pansy became a legend in horse circles. Using an array of previously unknown primary source materials from the Yount-Manion family archives, photographs never before published, and recently discovered film, McKinley and Riley present a book filled with incredible acts of generosity, long-standing controversies, intrigues, and twists and turns at every point. 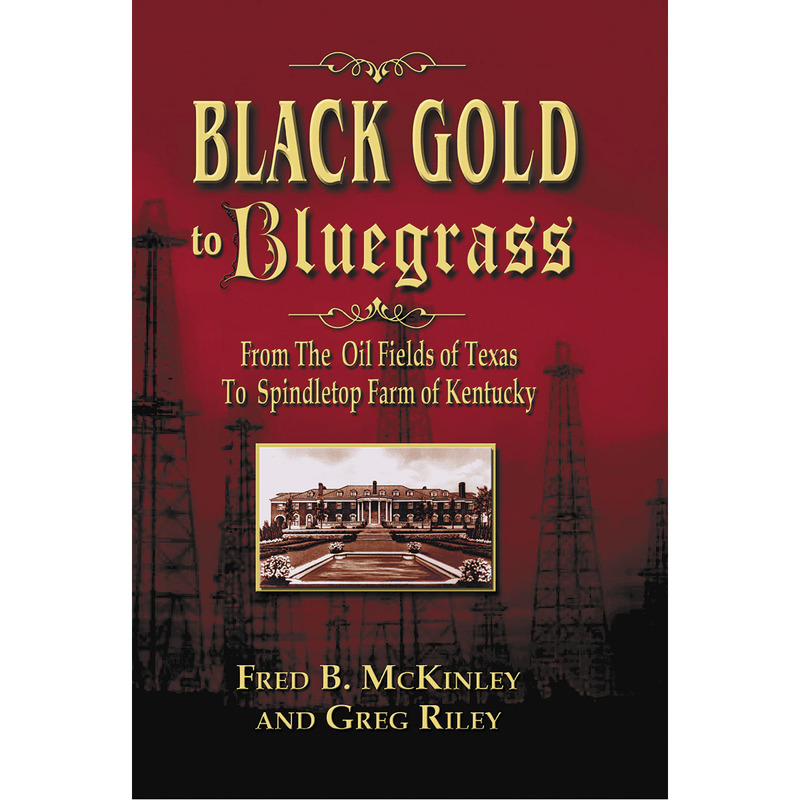 Black Gold to Bluegrass is a must for general readers and scholars alike, whose interests lie in Saddlebreds, antique automobiles, or violins; and for oil enthusiasts, the book paints a rags-to-riches story of a true wildcatter turned contemporary hero who embodies the American dream.